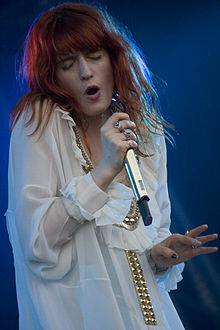 Despite receiving exemplary grades in secondary school and getting straight A’s on the General Certificate of Secondary Education, Florence Welch spent many school nights singing. Welch, who was diagnosed with dyslexia in primary school, succeeded in school, but found no passion in her studies. Many nights, she would skip lessons in favor of reading scary stories and pursuing the arts. Welch said she’s "not great at logical thinking" and enjoyed doodling instead of schoolwork. Instead of attending college, Welch opted to go to Camberwell College of Arts, and after her first year, she was discovered singing in a bathroom. Now, Welch has a successful recording career as the lead singer of Florence + the Machine, most known for its song Dog Days Are Over. She attributes her off-the-beaten-path music style and fashion sense to her desire to be different—which she believes is not a negative thing. "I was a short, chubby kid, very quiet, and I [had] dyslexia, which made me feel different than everyone else," she said. "As I got older I experimented with my hair and types of clothes, from Spice Girls to Little House On The Prairie styles." You can read her full interview over at The Guardian.